When it comes to rain and cold temperatures, Michelin's Power All Season Tire takes all-conditions performance to the next level. 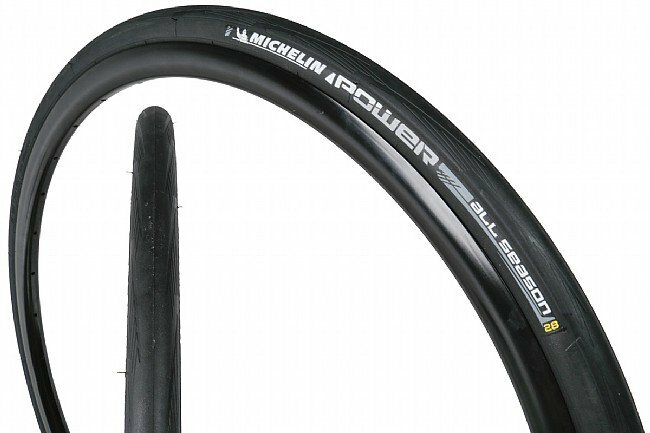 Compared to the Pro4 Service Course, the Power All Season gives a 5-watt advantage when it comes to rolling resistance, yet the Grip Compound rubber hooks up 15% better when the road gets wet or slippery. Add to that a Hi-Grip Design tread pattern, and descending in the rain or taking high-speed corners never made you feel more at home. 700c diameter. 55 TPI casing. Folding bead. Claimed weight is 230 g (23 mm), 270 g (25 mm), 295 g (28 mm). Flat after 4 miles on tiny piece of glass. OK, its stickier than the Schwalbe it replaced, but what use is it if it flats on a tiny 18 (3mm) piece of glass after 4 miles of its first use? Not just a flat, but the glass chip embedded itself in the puncture resistant belting and had to be dug out, leaving a hole all the way through the tread and turning a $64 tire into a worthless piece of trash. Even worse, the bead is so tight that I broke 3 tire levers getting it off. Will not buy these again!!! I've ridden on these tires a few times in the cold temperatures. Loving it so far as I've had no punctures despite grit, sand and some salt on the roads. I've had to run 100 psi instead of my usual 115 psi on my Michelin Power summer tires. The feel isn't as good as the summer tires but they still grip well. Great tire, long wearing, tons of grip but not as supple as their race tire. I rode 7000 miles outdoors this season and flatted 15 times. These tires have outperformed my Rubino Pros and my Gravel Kings. Roll nice,relatively supple and no flats yet!